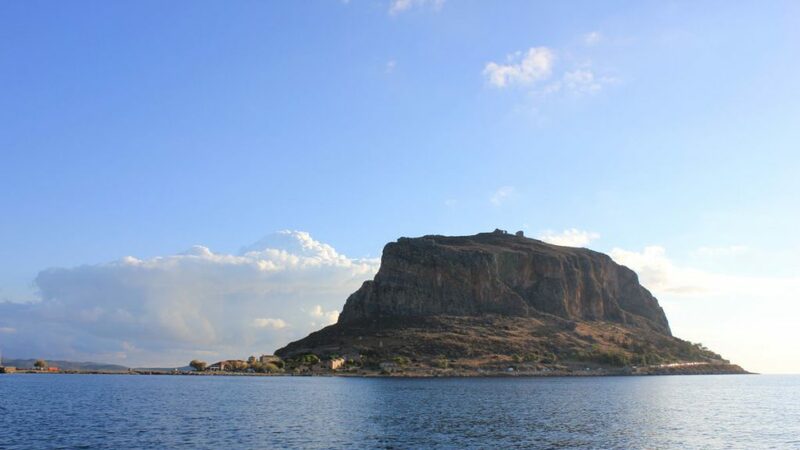 Each year Monemvasia attracts thousands of visitors; it’s a destination firmly on mass tourism’s radar. The towering islet and its medieval village is one of the most popular attractions in the Peloponnese. Offering some fine boutique accommodation and eateries with serene views linked by a maze of alleyways, a trip here is always unforgettable. But, above all, it is its history that pulls us to this special place. From your eyrie high above the terracotta roofs and church domes, looking out across the silver blue Aegean, time will seem to stop for a while, the world’s stresses left behind. 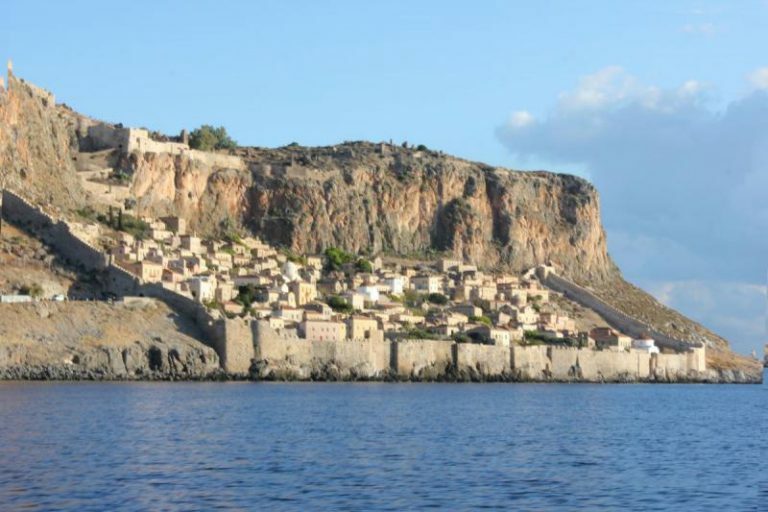 While Monemvasia is thought to have been an ancient Minoan trading post, its first recorded settlement (in the upper now ruined part of the town) was by residents of Sparta in the late 6th century. From the 10th century it developed into a major maritime centre and became a regular stop for traders plying the Mediterranean from Constantinople westwards. Having resisted Arab invasion and the Normans, Monemvasia was part of the Byzantine Empire until the Venetians arrived in the early 15th century. Ottoman rule held sway, through its population peak of 40,000 in the 17th century, until the island rock was liberated from the Turks in 1821. Today, exploring the medieval town to reveal its rich historical layers is one of the great Peloponnese experiences. Let the narrow cobbled alleyways draw you up through the ancient town and sooner or later you’ll find a terrace with one of the Aegean’s most sublime views. From your eyrie high above the terracotta roofs and church domes, looking out across the silver blue Aegean, time will seem to stop for a while; the world’s stresses left behind. Monemvasia’s most famous son is Yiannis Ritsos (1909-1990), one of Greece’s renowned 20th century poets. Ritsos’ writing redefined modern Greek poetry and today you can visit his family house near the entrance to the town, and his final resting place nearby. 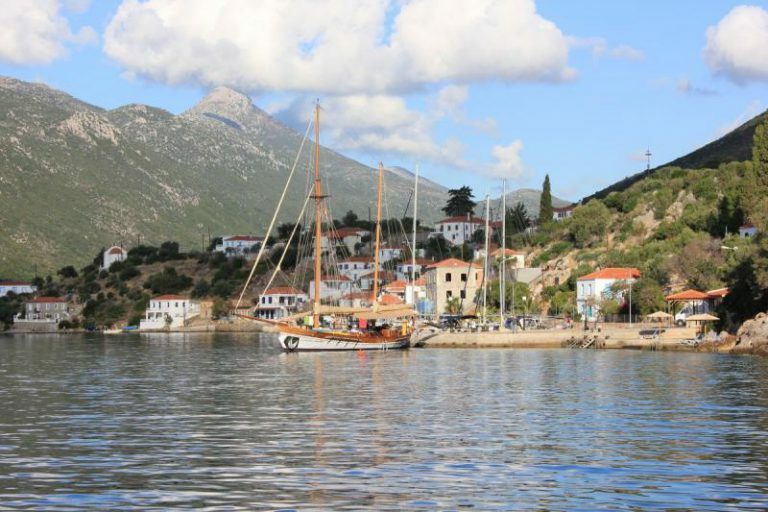 If Monemvasia is eastern Laconia’s most celebrated destination, it is not the only treasure in a region rich in natural beauty and historical sites. The municipality of Monemvasia comprises an area of more than 900 square kilometres (half of which is mountainous), and the region’s primary industry remains agriculture. Beyond the reference point of Monemvasia itself, tourism to the area has been increasing in recent years, with overseas visitors keen to sample the unique experiences on offer. This is a land of hidden coves and secluded beaches, where an ancient lost city (Pavlopetri), submerged under shallow crystal clear waters, has waited 5,000 years for you to glimpse its watery fate. Surprises like Pavlopetri on the municipality’s south-west coast are what makes this unspoilt corner of the Peloponnese such a gem. Beyond the history and archaeology, this is a place for beach lovers; over 50 beaches are accessible by car, but many more can only be reached by foot or boat. The white sands and iridescent blue water of Elafonissos (a short ferry ride from the mainland near Pavlopetri) – make this tiny beach island one of the most popular day visits. Twenty kilometres north of Monemvasia, the village of Gerakas is set on Europe’s most southerly fjiord. With its small harbour lined with a handful of fish tavernas, (it’s famous for its seafood) Gerakas is one of those spots where the pace of life slows, and the nourishment is spiritual as well as physical. Twenty kilometres from Monemvasia the village of Gerakas sits at the entrance to Europe’s southernmost fjord. For hikers, the Monemvasia region offers a stunning interior that suits intrepid climbers and country walkers alike. On the north-east coast of Laconia, Kyparissi is ideal for rock climbing, with more than a dozen routes, some through vertical limestone cliffs. For those wanting a more horizontal journey through the landscape, there is a network of trails, through ancient vineyards, olive groves, and citrus orchards – many through beautiful gorges covered with cyclamen in summer. If exploring caves is your thing, the Monemvasia region has them in spades. The caves of Kastania near Neapolis, with their Jurassic heritage and remarkable stalagmites (formed over 3,000 years), are some of Europe’s most unique caves. Nature, in all its rich diversity, is central to the region’s attraction. At Cape Malea, near the municipality’s southernmost tip, lies one of its most extraordinary manifestations – the remains of a forest of palm trees, turned, as if by some enraged mythological god, to stone. But then, myths and legends are never far away in the Peloponnese – the land where Hercules fought the Nemean lion, where Paris of Troy eloped with Helen of Sparta, and from where the Argonauts embarked in search of the Golden Fleece. 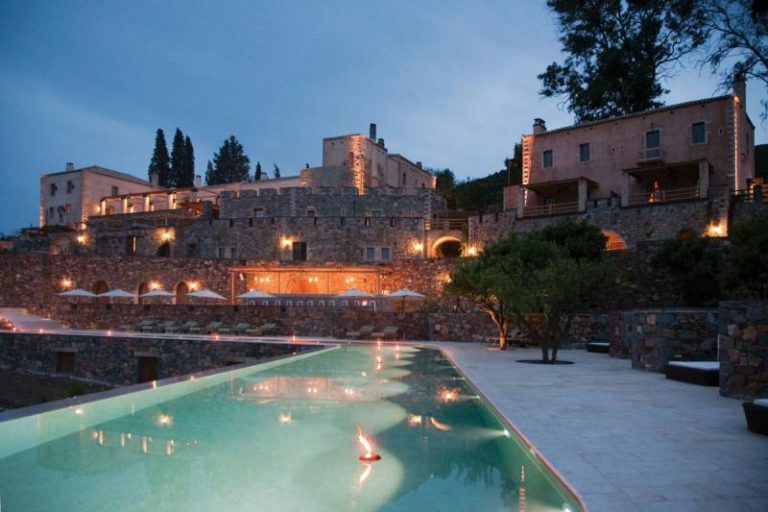 Few accommodation choices in the Peloponnese can match the sophistication and sheer elegance of the Kinsterna Hotel. This former Ottoman mansion and estate, the site dating from the Byzantine era, has been lovingly reimagined, and its award-winning credentials are well-deserved. On the mainland, set on high ground seven kilometres south-west of Monemvasia, Kinsterna is pure unadulterated luxury, but it’s not about bling: this is a place of understated elegance and refined comfort. Beyond its elegant, beautifully but simply designed bedrooms, and its fine customer care, Kinsterna’s appeal stems from its philosophy – one that includes reviving traditional crafts and farming techniques on its 18-acre grounds. Today winemaking and olive oil production (for generations the estate’s lifeblood) are integral to the hotel’s mission, and with its own gardens supplying fruit, vegetables, and herbs, Kinsterna’s aim is to come as close as possible to a totally self-sustainable community. This is not just any ‘six-star’ hotel, this is a place built on the idea of cultural regeneration, with guests encouraged to take part in the time-honoured customs of the local community. It’s this immersive experience that sets Kinsterna apart; a stay here offers the chance to become part of the local culture, to intimately engage with traditions dating back centuries. Guests are invited to take part in winemaking, learn the old ways of the village baker, and explore the area’s traditional gastronomy in cooking classes. 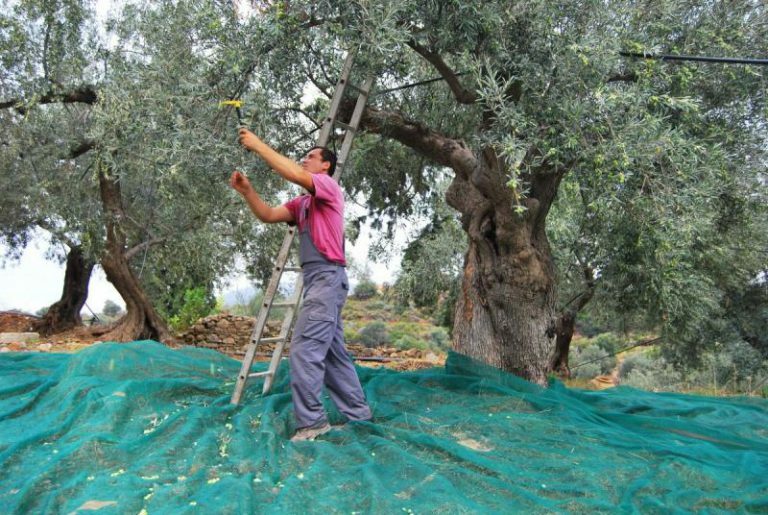 October ushers in the olive harvest at Kinsterna. For more energetic types, there’s hiking in the lush hillsides surrounding the estate. But make no mistake, along with all this access to activity, Kinsterna is a place of deep and quiet relaxation. With its two infinity pools (one for families with young children), tranquil swims and a day of sun-kissed lounging poolside – with only the cicadas breaking the silence – is always on the menu. For deeper meditation and a massage, treat yourself to the hotel’s spa, where masseurs use local honey, herbs, and citrus oils to heal and pamper. Finally, beyond its gorgeous bedrooms and villas, the crucial ingredient in Kinsterna’s winning recipe is its food. Under the watchful eyes (and discerning palates) of chef de cuisine Giorgos Hapsas and sous chef Thodoris Gliatis, Kinsterna’s mouthwatering dishes feature the finest free-range and organic products sourced from nearby farms, as well as produce harvested from the hotel’s gardens. Think gourmet delicacies such as lobster pappardelle, shrimp risotto with tsipouro, and rooster confit with Xylopita pasta (made from goats’ milk) and local anthotiro cheese. Complemented by the hotel’s own fine wines – 10 grape varieties are grown on the estate – it’s hardly surprising the awards keep coming for this Pelopponesian paradise. Kinsterna is an example of the Greek luxury hotel sector at the top of its game, drawing on local cultural traditions and articulating its location’s inspiring history with imagination and flair. The hotel’s manor house and main accommodation as seen from one of the two pools. Monemvasia is 300 kilometres from Athens. With the new highway completed between Lefktro and Sparta it’s a comfortable drive that can be completed in three and a half hours. * Michael Sweet was a guest of Kinsterna Hotel, Monemvasia, and gratefully acknowledges the assistance of Aegean Airlines in his research for this article.